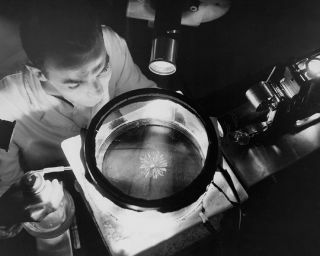 A NACA Physicist studying alpha rays in a continuous cloud chamber. In this historical photo from the U.S. space agency, NACA Physicits studying Alpha Rays in a continuous cloud chamberon Sept. 12, 1957. A cloud chamber is used by Lewis scientists to obtain information aimed at minimizing undesirable effects of radiation on nuclear-powered aircraft components. Here, alpha particles from a polonium source emit in a flower-like pattern at the cloud chamber's center. The particles are made visible by means of alcohol vapor diffusing from an area at room temperature to an area at minus -78 deg. Centigrade. Nuclear-powered aircraft were never developed and aircraft nuclear propulsion systems were canceled in the early 1960s.